Why Putin's Pal, Germany's Ex-Chancellor Schroeder, Isn't On A Sanctions List : Parallels Gerhard Schroeder went from chancellor of Germany to chairman of key Russian energy corporations. But many Germans are in no mood for more sanctions against Kremlin interests. Former German Chancellor Gerhard Schroeder (left) and Russia's then-Prime Minister Vladimir Putin at a meeting with employees of the Portovaya gas compressor station outside Vyborg, in western Russia, in September 2011. "It is important that there are sanctions against those who promote Putin's projects abroad," Ukrainian Foreign Minister Pavlo Klimkin told German newspaper Bild last month. 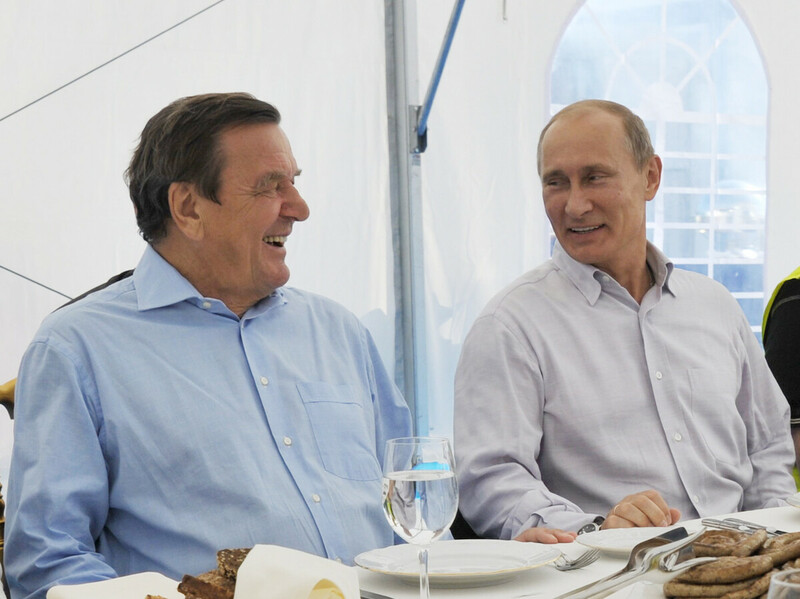 "Gerhard Schroeder is the most important lobbyist for Putin worldwide." 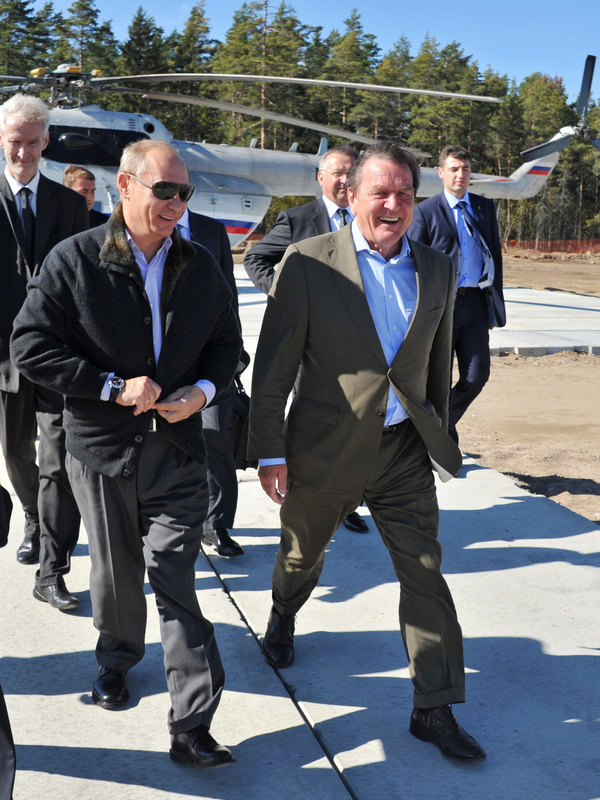 Putin (left) and Schroeder attend a test pipeline launch at a gas compressor station outside Vyborg, in western Russia, in September 2011. The Ukrainian official's comments came after a Wall Street Journal opinion piece also questioned why Schroeder has avoided sanctions. The 74-year-old Social Democrat is simultaneously one of Germany's most loved and almost most hated postwar leaders. Schroeder became chancellor in 1998 and oversaw a sweeping overhaul of the country's welfare and labor systems, aiming to boost economic and job growth. He won a second term in 2002, but his pursuit of reforms ultimately led to his political demise. In July 2005, he lost a no-confidence vote in parliament and Angela Merkel's conservatives took over after subsequent early elections. The transformation in Schroeder's relationship with Russia was equally dramatic. When he first became chancellor, he sought to distance himself from the close ties his predecessor, Helmut Kohl, had with then-Russian President Boris Yeltsin. That changed after Vladimir Putin was elected in 2000, said Putin biographer Boris Reitschuster, a former Moscow correspondent for the German online magazine Focus. He said Putin and Schroeder, who would talk to each other in German, became fast friends. "Putin once said as a KGB officer, he learned how to get people on his side, to turn people," Reitschuster said. "The Russian opposition says Gerhard Schroeder was his masterpiece." In late 2004, Schroeder was widely criticized for calling Putin a "flawless Democrat." German respect for Schroeder plummeted further over his ties to Russian business. During his final months as chancellor, he shocked many Germans by shepherding through a multibillion-dollar pipeline project called Nord Stream, transporting gas from Russia to Germany. The pipeline is majority-owned by the Russian state gas company Gazprom. Shortly after leaving office, Schroeder became chairman of the pipeline shareholders' committee. "It raised the question — was there a connection?" said Timo Lange, a political scientist with the watchdog group LobbyControl in Berlin. "That is something that leads to a great loss of public confidence, when many people say: 'Aha, this proves that politicians are not trying to advance the country,'" but their pocketbooks. Other controversial Schroeder posts linked to Russian interests followed. Last fall, he became chairman of the supervisory board of Russia's largest oil company, Rosneft, which is on the EU and U.S. sanctions list. "I do not think what Mr. Schroeder is doing is right," Merkel told Bild in an interview last summer before Schroeder accepted the job. But Wolfgang Buechele, who chairs the German Committee on Eastern European Economic Relations, defended Schroeder's Rosneft post. He said it makes sense to have a German on the board given how much Germany — Europe's largest economy — depends on Russian gasoline. "Russia is, at this point in time, the largest energy supplier to Germany," said Buechele, who is the CEO of the construction engineering company M+W Group. "It will stay that way for a long period of time because pipeline gas is not available from that many sources." Schroeder's office declined NPR's request for an interview. Last summer, during a campaign event for his Social Democrats, Schroeder accused those who criticize his Russian ties as having an interest in starting a new Cold War. But Reitschuster said he finds Schroeder's continuing ties to Russia embarrassing for Germans. "'Schroederization' is a foreign word in [the] Russian language, [which] means corruption of the political elite," he said. "And we [in Germany] are very corrupted now by Vladimir Putin, by his money, and that's why we have this atmosphere that we should be good friends with Russia." "The way Gerhard Schroeder is lobbying for Putin's positions in Germany is disgusting and is a huge contradiction to the oath he once gave to serve the German people and German interests," said German lawmaker Omid Nouripour, who heads the foreign policy committee in parliament for the Green Party, Schroeder's onetime coalition partner. He accused the former chancellor of having a brazen conflict of interest. "Imagine Barack Obama now being, I don't know, the lobbyist for Chinese government in United States," he said. That would cause "damage to the office of the U.S. president. This is why I think we need other rules in this country for people who are leaving office." He, like many other Germans, wants top German officials like chancellors and presidents prevented from lobbying or taking jobs that pose a conflict of interest for longer than the current 18-month maximum. (That rule came about after Schroeder's post-government line of work.) But they draw the line at imposing sanctions on Schroeder. "The German government and chancellor see no reason to consider such things," government spokesman Steffen Seibert said in March, referring to the idea of penalizing the former leader. Their reluctance may have to do with the fact many Germans are growing weary of sanctions. Penalties on Russian officials and individuals close to the Kremlin are costing Europe more economically than Russia, according to Buechele, the German business leader. Nearly 3 out of 5 Germans want to improve relations with Russia, according to a March poll by the conservative newspaper Die Welt. The way many in Germany see it, sanctioning more of Putin's cronies — even a German one — is not likely to lead them closer to that goal.